Ragni Steen Knudsen at volleyball practice at the University of Texas-Rio Grande Valley on Monday, Sept. 10, 2018, in Edinburg. EDINBURG — Not long after playing her final match with the Norwegian national team on Aug. 25 in the European Volleyball Championship, UTRGV senior Ragni Steen Knudsen began the more than 5,000-mile journey back to Edinburg. The longest of her three restless flights was 11 hours, but she was back on campus by the night of Aug. 26. And come Aug. 28, she was back in action for the Vaqueros, traveling with the team to face Texas A&M-Corpus Christi. Knudsen said she didn’t expect to return to the lineup so quickly, but nagging injuries to some of UTRGV’s other hitting options pressed her into early action. She said her mind wasn’t all there for her first match, and jet lag was definitely still a factor. She didn’t show any signs of struggling on the court, picking up 17 kills and 11 digs to help UTRGV to a five-set win. In fairness, standout performances are hardly out of the ordinary for Knudsen. 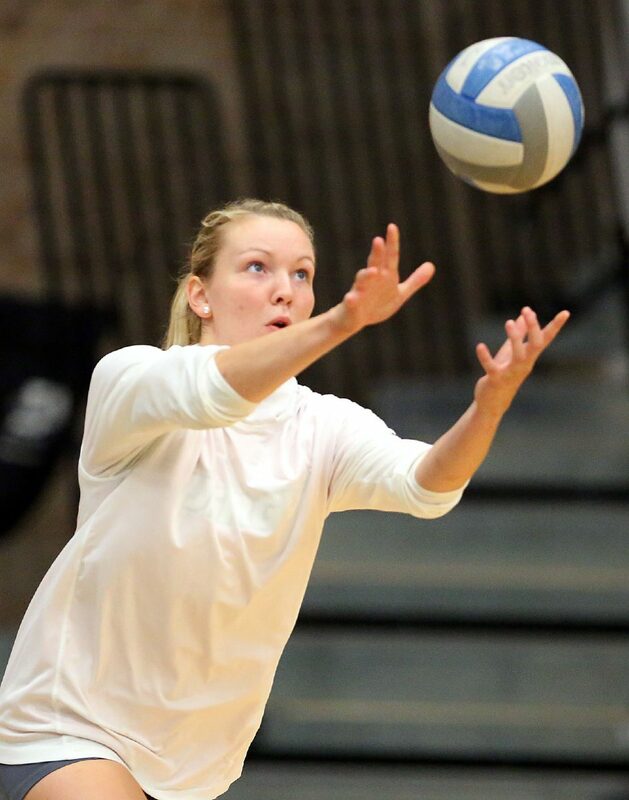 The 2018 WAC Preseason Player of the Year, Knudsen missed UTRGV’s preseason training and first three matches in favor of international competition but has quickly rounded back into form, ranking just shy of the team lead with 3.42 kills per set. UTRGV is 9-5 heading into the start of conference play Thursday at CSU Bakersfield. Knudsen, a native of Myre, Norway, has been playing in the youth national team system since she was 14 years old. Her parents are club volleyball coaches, and her sister, Marianne, is a 28-year-old setter on the national team. Knudsen faced a difficult decision this summer: play for her national team at the highest level, or be with UTRGV for preseason training and the start of her senior year. Knudsen said her teammates and coaches were supportive of her decision to play internationally. Her experience started with training in May and culminated with four matches between Aug. 15-25. Norway went 0-4, losing to Ukraine, Greece and Montenegro twice. Knudsen led Norway in attacks in all four matches. Lowery said Knudsen returned to the team in great shape and has the advantage of playing with a familiar group of setters. Knudsen said the international competition was more challenging than what she faces in college, as she often ran up against professional players. Still, she said she was one of the older players on Norway’s young roster, assuming a leadership position that helped prepare her for her final year at UTRGV.